There are just some things about living in NYC’s lower east side that you’d be a right nut not to love. In a total of twenty minutes, I procured a pound and a half of gorgeous local Frenched lamb rib chops from Whole Foods and dried fruits, nuts and a creamy, sharp goat cheese from Russ and Daughter’s (and if you’ve ever tried to go in there on a Sunday, you’d appreciate the spaciousness and quiet going in there early on a Thursday evening provides). Then I hauled the lot up to a roomy apartment with a great view to gaze out at while I got some work done. Ok, I don’t live in the LES. But the current man-in-my-life does, and he’s stuck out of the country on, um, legal matters (insert ominous music). And while absence does make the heart grow fonder (and crankier), the presence of his apartment and darling roommate do somewhat soften the blow of not knowing when he’s coming back (ooh, it’s scandalous). So, food and the Canadian. What’s the connect? Since I’ve started dating Mr. Current MIML, my playing with meat has lessened to a great degree. MIML doesn’t eat much meat. No pork, beef or lamb. Very little duck. He does eat shrimp. I find this out a few dates in and my left arm starts to hurt a bit. I breathe again when I realize that MIML’s roommate devours meat and likes to cook. Hence my presence at their apartment this evening with said booty. I chose lamb ribs because, well, the market had no duck. And the boys don’t have a proper dutch oven for me to slow-roast anything. Or a deep saute pan for anything on the stove. Lamb ribs only require a sheet pan and season delectably with salt, pepper and rosemary, so the list of ingredients that had to be added to their cupboard was minimal. These ribs cook quickly and are succulent and juicy, an impressive dish for one so simple. You hear me out there? If you want to serve up a savory dish that requires little time in the kitchen and will easily impress both a friend who doesn’t know how to George Forman a hamburger and one who believes foie gras is a food group, roast some lamb ribs. Don’t try to over season or over sauce. If they’re cooked perfectly, all they need is a minimal amount of love to shine. The roommate suggested roasted cauliflower with dried apricots and pine nuts. Russ and Daughter’s didn’t have pine nuts, so raw cashews took the prize. Delicious addition. In a relaxed atmosphere we created a simple, healthy, delicious lamb dinner that was the perfect accompaniment to red wine, good conversation, a comfy couch and The Social Network (mixed feelings on that one). extra virgin olive oil (we used Whole Foods’ organic blend). Place florets in a baking dish and season with salt, pepper and olive oil to taste. Make sure they aren’t crowded in the dish. Stick on the middle/low rack in the preheated oven. These will cook for about 20 minutes before you add the lamb. Meanwhile, chop the cashews and toast lightly in a dry frying pan on low heat, until they start to smell nutty and are slightly brown. Remove from heat to cool. Spray a baking sheet with nonstick spray and lay lamb ribs out. Drizzle with olive oil, salt and pepper to taste, and about 2 tablespoons of fresh rosemary. With your (clean) hands, rub the spices in on both sides until evenly coated. When the cauliflower has been in the oven for at least 20-25 minutes and is starting to soften, place the lamb in, uncovered, on a high rack (2nd down in the oven works best). 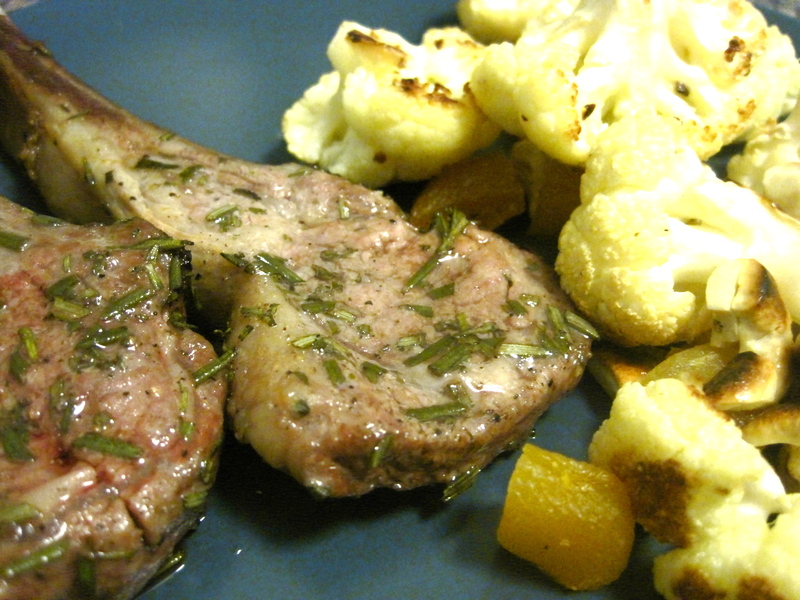 Cook for ten minutes, flip and cook for 5-7 minutes more, depending on how rare you like your lamb. Remove all from the oven. Let the lamb sit for 3 minutes before removing to serving plates. Meanwhile, toss cauliflower with apricots, cashews and a little more olive oil / salt and pepper if necessary.